independent transport videos welcome you to this 2016 special edition of the Merseyside Transport Trust's annual “Liverpool Buses Running Day” DVD programme. This time we have also included the “Port Panorama” event that took place on Easter Sunday. We start our programme with the annual Running Day on Sunday 11th September 2016. This year there was a change to the usual format, as Liverpool South Parkway and Penny Lane were not available due to road works, so the event was centred on Mann Island at Liverpool Pier Head and Aigburth Vale. Our filming opens at the Pier Head where we see some of the contemporary bus scene supplied by Arriva and Stagecoach, with a backdrop of the “Three Graces” buildings looking resplendent against a clear blue sky. We see Stagecoach’s brand new ADL Enviro 400MMC double deckers recently introduced to Liverpool operating alongside Arriva’s Enviro 400s. Our cameras then take up positions in other parts of the city to see the arrival of the real stars of the day – the preserved buses from the MTT collection and visiting vehicles representing the Crosville and Ribble fleets. These locations include Dale Street, Byrom Street and the mouth of the Queensway Mersey Tunnel. Mann Island at the Pier Head in the past was always full of Crosville and Ribble buses and coaches, with Liverpool buses passing through. Today was no exception – the past had been brought back to life! Our next location is Aigburth Vale in the south of the city where we film the action before boarding former Birkenhead Corporation 10 (FBG 910), a Massey bodied Leyland Titan PD2 for a run back to Mann Island. A number of these Birkenhead buses were transferred to Liverpool with the formation of the Merseyside PTE. With more filming completed at Pier Head we board 1111 (UKA 562H), Leyland Atlantean PDR2/1 with Alexander H79D (“Jumbo”) body for a ride to Speke Hall, savouring the sounds of it’s Leyland O680 engine. Our filming is concluded where the day started at Mann Island, where we see the buses on the feeder services leaving and others turning to take up their final duties and then departing to the depot after a most enjoyable event. Well done to all in organising this excellent Running Day. From the blue sky and warmth of September we look back to Easter Sunday when our cameras dodged the hail stones and high winds to bring you the “Port Panorama” event organised by the MTT. 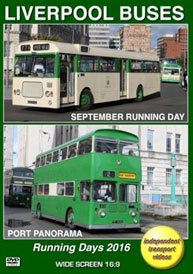 The “Port Panorama” was a tour run by Liverpool Corporation in the 1960s to give people a view of the docks. Today most, if not all of the docks have changed dramatically so bearing this in mind the MTT ran the tour in two sections - northern and southern. Four vehicles were used on the day, AEC Regents A36 and A267, Leyland Atlantean L835 and Bristol RE 2025. Filming locations were at Bath Street, Dale Street, Stanley Road, Stanley Dock, Princes Dock, Queens Dock and Brunswick Station. We also view the docks from A267, A36 and L835 as we travel along the Dock roads, with a good amount of filming at Mann Island, Pier Head in between the journeys! We are sure you will enjoy this very special DVD programme featuring two events organised by the Merseyside Transport Trust.